We are fortunate at Saint Antonios to have a talented choir, who together beautifully convey the prayers, liturgy, and the associated angelic passages. 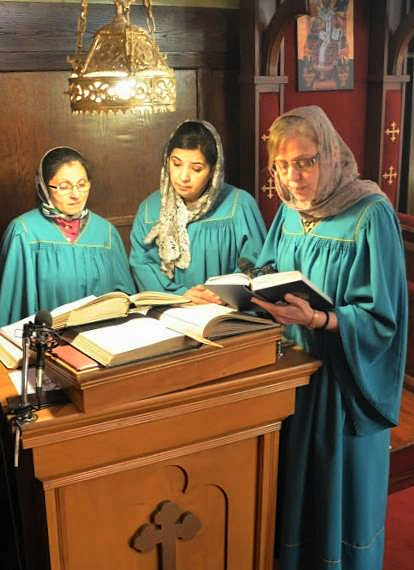 The group is open to all Parish members, and is led by Khouriyee Rita Saikali, whose kind spirit is conveyed through her voice. Recordings by the Khouriyee and her colleagues can be requested by emailing info@saintantonios.ca . Those desiring that a CD be shipped can likewise submit a request. audio only: "Today is the day of Resurrection" & "The Paschal Stichera". I believe in one God, the Father Almighty, Maker of heaven and earth, and of all things visible and invisible; And in one Lord Jesus Christ, the Son of God, the Only-begotten, Begotten of the Father before all worlds, Light of Light, Very God of Very God, Begotten, not made; of one essence with the Father, by whom all things were made: Who for us men and for our salvation came down from heaven, and was incarnate of the Holy Spirit and the Virgin Mary, and was made man; And was crucified also for us under Pontius Pilate, and suffered and was buried; And the third day He rose again, according to the Scriptures; And ascended into heaven, and sitteth at the right hand of the Father; And He shall come again with glory to judge the quick and the dead, Whose kingdom shall have no end. And I believe in the Holy Spirit, the Lord, and Giver of Life, Who proceedeth from the Father, Who with the Father and the Son together is worshipped and glorified, Who spake by the Prophets; And I believe in One Holy Catholic and Apostolic Church. I acknowledge one Baptism for the remission of sins. I look for the Resurrection of the dead. And the Life of the world to come. Amen. Glory to thee, our God, glory to thee. O heavenly King, O Comforter, the Spirit of truth, who art in all places and fillest all things; Treasury of good things and Giver of life: Come and dwell in us and cleanse us from every stain, and save our souls, O gracious Lord. Holy God, Holy Mighty, Holy Immortal: have mercy on us. (Thrice) Glory to the Father, and to the Son, and to the Holy Spirit: now and ever and unto ages of ages. Amen. All-holy Trinity, have mercy on us. Lord, cleanse us from our sins. Master, pardon our iniquities. Holy God, visit and heal our infirmities for thy Name's sake. Lord, have mercy. (Thrice) Glory to the Father, and to the Son, and to the Holy Spirit: now and ever, and unto ages of ages. Amen. Our Father, who art in heaven, hallowed be thy Name; thy kingdom come; thy will be done on earth, as it is in heaven. Give us this day our daily bread; and forgive us our trespasses, as we forgive those who trespass against us; and lead us not into temptation, but deliver us from evil. Through the prayers of our holy Fathers, Lord Jesus Christ our God, have mercy on us and save us. Amen. "Christos Anesti" (Greek, Christ has risen). "El Massih Kaam" (Arabic, Christ has risen), by Fairouz.